Leh, Ladakh, J&K, India – The road from Shiwatsel to Shey runs parallel to the Indus River, at certain points winding through clusters of white-washed stupas. As usual, groups of local people lined the road to catch a glimpse of His Holiness the Dalai Lama as he passed this morning. Once he turned off the main highway, heading for the Dudjom Nunnery in Upper Shey, both sides of the road were lined by local people including hundreds of smiling school children, neat in their uniforms. His Holiness was welcomed as he stepped out of the car by Urgyen Rinpoche and almost immediately several members of the crowd lunged forward, their heads thrashing to and fro, apparently possessed. As security officers restrained them, His Holiness’s touch or kind gesture seemed to subdue them. At the threshold of the Nunnery’s new temple, His Holiness cut the ribbon, recited prayers of consecration and pushed open the doors indicating the temple’s inauguration. At the foot of a Thousand Armed, Thousand Eyed Statue of Arya Lokeshvara, perhaps fifteen metres tall, he lit a lamp, before taking his seat facing the assembly of Lamas, monks, nuns, and other guests. Tea and ceremonial sweet rice were served as prayers were recited, including an evocation of the Medicine Buddha, the Seven Line Prayer to Guru Padmasambhava and a Praise of the Twelve Deeds of the Buddha. In introductory remarks Khenpo Tsewang Rinzin described Urgyen Rinpoche’s efforts over many years to uphold the teachings of the Buddha, among which were the founding of this nunnery and construction of this assembly hall that were now complete. Expressing deep appreciation of His Holiness’s presence, he said that since His Holiness embodies the enlightened deeds of his predecessors, even to hear his name leaves a special imprint for enlightenment. 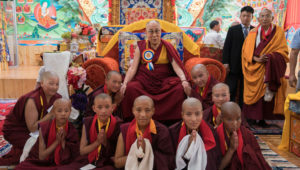 In his report, Urgyen Rinpoche referred to “this excellent occasion when His Holiness has graciously acceded to our request and come here in a kindness that cannot be repaid”. He mentioned that 52 nuns presently belong to the Nunnery, of whom the younger ones attend school and college, while the older ones remain in the Nunnery to do spiritual practice. Rinpoche said that his prime intention is to take care of the nuns’ education and health, in the hope, despite limited resources of serving the Dharma and sentient beings. He concluded with prayers for His Holiness’s long life. Dr Sonam Dawa, CEC of the Ladakh Autonomous Hill Development Council spoke next, less, he said, in his official capacity, than as a resident of Shey. He observed that Buddhists, Christians and Muslims live together in harmony in this locality. Moreover, since Drukchen Rinpoche has established the Druk Pema Karpo School nearby and His Holiness has come to inaugurate this Nunnery, local people feel blessed by their Lamas. Finally, he noted, following the devastating cloudburst that wrought such damage in 2010, HelpAge India was establishing a valued old people’s home in the local community. Nuns, four challenging and four responding, then gave a debate presentation before His Holiness, discussing synonyms of existence. Soon after they had gathered around His Holiness and had their photograph taken with him there was a sharp bark from the back of the temple. A grey Apso came trotting in and, placing its front paws on the step in front of him, looked straight up at His Holiness, wagged its tail in greeting and left. “Here in Shey, Urgyen Rinpoche has worked hard,” His Holiness commented as he addressed the congregation. “Not only has he constructed this temple, but he is making provision for the education of these nuns. He has made efforts and local people, supporting him out of devotion, have contributed their help. I really appreciate all that’s been done here, which has also included saving the lives of animals. This is in contrast to the great tragedy and obstruction of the teachings of the Buddha that has taken place in Tibet. We all follow the same tradition, but merely praying that the teachings flourish will not achieve that goal. “To ensure that, we have to know what the teachings are about. The great Indian master Vasubandhu advised that the teachings of the Buddha can be classed as scriptural and experiential. To keep them alive we need both to study and develop experience of them. This means reading the scriptures and applying what we learn by exercising the Three Trainings in ethics, concentration and wisdom—in other words, study and practice. Here in this Nunnery we have nuns keeping their vows, as well as studying logic and debate. The overall purpose of combating negative emotions cannot be done by prayer alone; it requires understanding and wisdom. His Holiness remarked that time does not stand still and yet the future can be what we choose to make it. We can develop a vision of the future we want to see and work towards fulfilling it. He said that in that context the nuns here and the school-children gathered outside really offer hope for the future, but they need both a modern education and an understanding of the inner world that will enable them to achieve peace of mind. His Holiness added that study should no longer be the preserve of monks and nuns. Lay people should do it too. He then gave transmission to the gathering of the mantras of Avalokiteshvara, Manjushri, Guru Padmasambhava, Hayagriva and Vajrakilaya. As he left the temple, His Holiness unveiled the foundation stone for the HelpAge India project for an old people’s home. Then, setting off from Shey, he drove up into Leh, where he was the guest of the Sunni and Shia Muslim communities at the Id-gah, an open-air enclosure reserved for offering Ramzan prayers. The President of the Sunni Community saluted His Holiness as a living symbol of love and peace. He pledged that the Muslim community from the Zoji Pass to Turtuk would continue to do its best to maintain communal harmony in Ladakh. He added that despite the deeds of some black sheep and distorted reports in the media, Islam is a religion of peace. 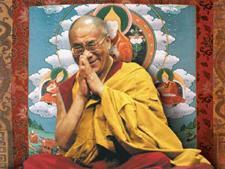 His Holiness responded, “Dear brothers and sisters, I feel really honoured. I’m happy to come here once more to visit the Muslim community of Leh. I have a commitment to trying to make this a happier, more compassionate world, because we are all the same as human beings. We are born the same way. As human beings we share the same basic compassionate nature. I’m also committed to promoting religious harmony. I’m a Buddhist monk and I might even claim to be a Buddhist scholar. We need our different religious traditions with their different philosophical points of view because of our different needs and dispositions. Millions follow these different traditions and we should respect them. “I first encountered Muslims where I was born. Then in Lhasa there was a Muslim community of about 2000. Some, from China, were butchers, and provided us with meat. Others were from Ladakh. When they first arrived, the Fifth Dalai Lama gave them land for a mosque and used to invite them to state functions. We all lived peaceably together. “In this country, India, we have a living example that the world’s religions can live in harmony with each other. I have suggested before that representatives of Indian Muslims consider interceding in disputes in other parts of the world between Shia and Sunni for example. As a Buddhist there’s not much I could do, but as fellow Muslims, you might help. His Holiness reported that on his recent visit to Zanskar, where there has apparently been friction between the Buddhist and Muslim communities, he advised both that since they have to live together, they should help each other and try not to boycott each others’ shops. He further reported being impressed when in Srinagar he met Muslims who used to live in Tibet, whose young people have learned to speak the exquisite Lhasa dialect of their parents. He has also counselled the Sikyong to look into employing some of them in the CTA. In offering words of thanks in Ladakhi at the end, the President of the Shia Community’s wish for His Holiness’s long life was met with unanimous applause. His Holiness then enjoyed a delicious lunch with his hosts, before returning to the Shiwatsel Phodrang.